But this year, I’ve admittedly struggled with writing this initial post, which might explain why it’s nearly 15 days late. It’s not to say that I don’t have any idea of what I want to accomplish in the year, it’s the fact that it’s too overwhelming to try and break down the four subcategories I’ve established. I’m a creature of habit and routine and I love nothing more than creating checklists and plans of attack for all of my major goals, but lately, I’ve been struggling to find that balance and enthusiasm I once had. 2017 was a year of accountability and 2018 was spent hammering down those routines for continued growth. As I look onto 2019, I feel that breaking down and almost ‘forgetting’ whatever routines I had, while starting from ground zero will be the best approach for the long-term success. What I mean by that is that I still want to focus on the four subcategories I’ve established (creativity, financial, fitness and intellectual), but I won’t hold myself to the unrealistic high standards because my life is in a much different place than when I originally made them. 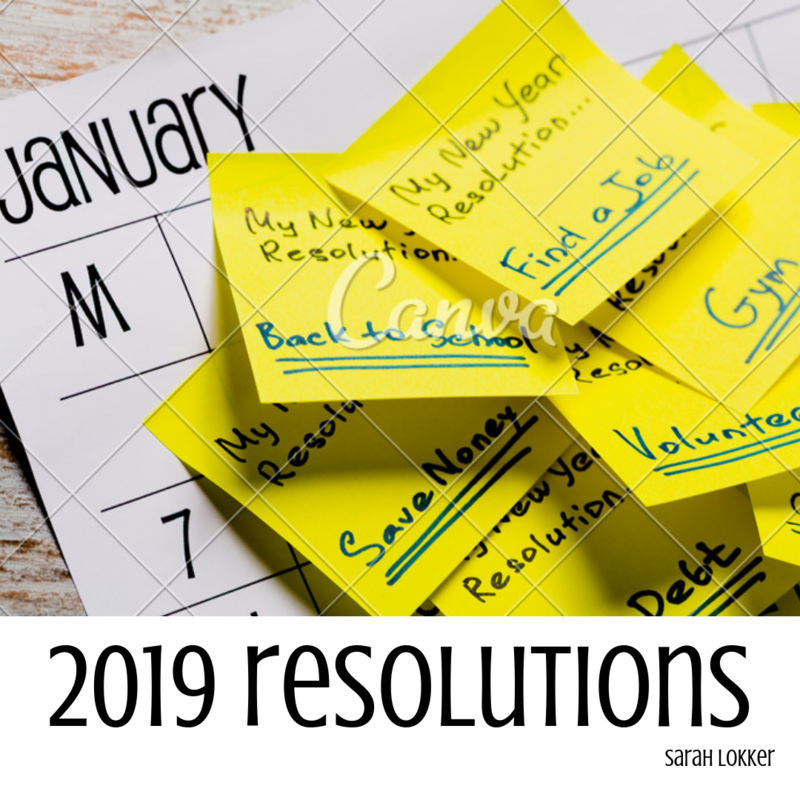 Instead of making these resolutions concrete, I want to adjust on the fly and not punish myself if I maybe don’t crush the goals. I want to use these resolutions more as a loose guideline of goals, rather than a sturdy checklist like the past. This is always my hardest resolution category because I define myself to only one outlet of creativity. Before, I used to think that creativity meant creating something physical, whether that being art or music, but now I’ve become more lax of that definition of creation. By definition, I am a content creator: I create content for this website as well as my YouTube channel and the amount of time, energy and investment in tools and gadgets I’ve put into them shouldn’t go totally unrecognized. Instead of belittling myself for not practicing that keyboard I bought off of Amazon, I’ve been learning to celebrate things like the improved Travel Vlogs I’ve created and it’s been an adjustment. I don’t like admitting I’ve ‘failed’ to do something, but sometimes refocusing attention helps you realize what your passions are. Nearly two years into the game, but I’ve finally started creating a posting schedule to stay on track with my sites. My goal is to make this more of a lifestyle blog, rather than just a beauty subscription review site, and I want to start incorporating more variation of posts, so if you have suggestions, let me know! However, I think finding creative outlets can help make someone more well-rounded. Recently, I’ve been stockpiling online classes I’ve bought on Stackskills, including a fundamentals of drawing bundle, as well as a bunch of social media management courses to help promote traffic on my sites. This will correspond with the Intellectual category later, but I want to work the two together because I feel as if I’ll be more successful if I look at it through an intellectual mind-frame. After being bit by the wanderlust bug last year, I spent a lot of the second half applying for travel credit cards, building my credit up and doing a lot of research on the art of travel-hacking. Out of the two of us, I consider myself the over-planner and used to stress to high heaven about paying for trips and excursions, but now I have a confidence in my financial standing that Ryan and I won’t break the bank when traveling. Right now, I’m not as financially happy as I was at the start of 2018. At the end of the year, I bought a new car and as happy as I am to be able to make such an adult-like investment on my own, it served me a dose of reality that I can’t spend my money willy-nilly anymore. It’s really taught me how to budget better and I’ve created ways of teaching myself to store money in different accounts. Speaking of spreading the wealth, I’ve been taking part of my paycheck and stowing it away into secondary savings to create that eluded emergency fund. I’ve also been taking cash out of my checking account and been using only the cash to buy things, rather than relying on my cards. I’ve felt that it’s helped tremendously with not overspending. One thing I’ve always been taught financially is that it’s important to invest in something. Recently, I’ve discovered Ellevest, a female-based investing company that is wanting to close the gender gap of investing and after signing up and receiving bonus incentive, I want to continue to let it grow. I certainly can’t add to it at the rate they suggest (I’m not made of money!) but I’d like to start stashing away money per quarter to help it grow in longevity. Just like everyone else, one of the biggest resolutions I want to tackle this year is the fitness bandwagon and already I feel like I sound like a broken record. Last year, I fluxed a LOT when it came to my weight: I started the year strong by hitting the gym every day, dieting well enough to lose roughly 20 pounds. Summer came and I felt confident (enough) to wear a two-piece and not feel like a total sack of 💩 on our European adventure. By fall, I was maintaining whatever progressed I made, but by winter I was completely derailed. During the fall, I had discovered 1st Phorm and really wanted to give it a fair shot, but felt that it wasn’t the right time. I know that’s a total BS excuse, but if I’m going to commit to something, I want to give it 110%. To start the new year, I’ve decided to partake in the Level-1 workout program while completing the New Year Sprint Challenge. A large majority of the 1st Phorm program is to meal-prep and healthy diet, so the game plan is to start incorporating that into the regime to get the full benefit. In 2017, I spent a good chunk of the year becoming in-tune with my mental health and adopted mindfulness. In 2018, I felt myself become more anxious and overwhelmed with things and it was because of the fact I stepped away from my mindfulness practice. (Not by choice, but by other things taking priority.) I want to start practicing meditation and yoga again because not only will it help with the mental headspace, it will also help with flexibility. As of late, this has been the one resolution where I’ve felt my wheels spinning the most. I mentioned that I had stockpiled online classes on Stackskills, but I feel overwhelmed with the amount of time it will take to complete everything. I have so many books I want to read, but don’t have the time to dedicate to them. I want to continue teaching myself Czech, but find it incredibly frustrating to complete even the simplest of lessons. For the intellectual resolution to work out, I need to establish schedules and checklists, which is ironically one of my favorite things to do. Instead of making excuses, I need to take the time to budget myself to avoid that feeling of dread and anxiousness when I don’t complete things on my to-do list. 2018 was a big year in finding obsessions in true crime, unsolved mysteries and a plethora of other topics to fill my brain with. As the year came to an end, I felt myself getting out of touch with podcasts and videos, and would love to get back on the bandwagon. Looking at the psychology behind serial killers or cult members has always intrigued me and I feel that learning about it will help keep me sharp. This entry was posted in lifestyle and tagged #blogger, bbloggers, beauty blog, blog chat, blogger girl, blogger life, blogger lovin, blogger style, bloggers, blogging, blogging gals, blogging tips, creativity, fashion blog, fbloggers, financial, fitness, fitness blog, fitness journey, goal, goal digger, goal oriented, goals, health and fitness, intellectual, life with sarah, lifestyle blog, on the blog, resolution, resolutions, sarah lokker, sarahhlokk, saving, savvy blogging. Bookmark the permalink.